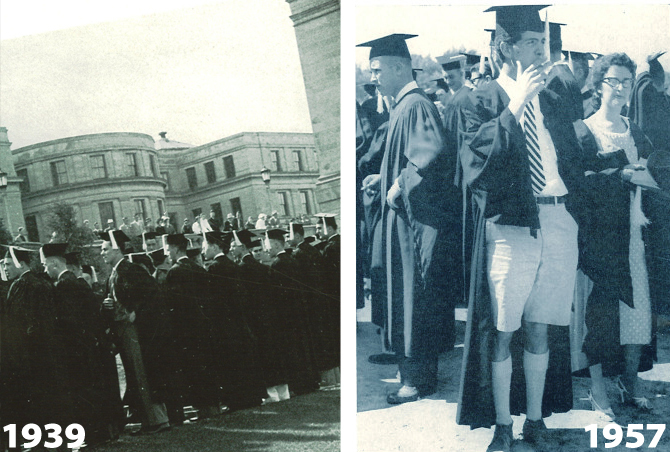 Times change and memories fade, but Hawkeye history lives on in the UI’s student yearbooks. A flip through the pages of the past offers a fascinating journey into fashion, pop culture, and campus life throughout the decades. Twenty years after its last printing, the Hawkeye remains the University Archives’ most popular resource. In response to the yearbooks’ high demand, the Iowa Digital Library recently took the entire Hawkeye set from the bookshelf to the World Wide Web. 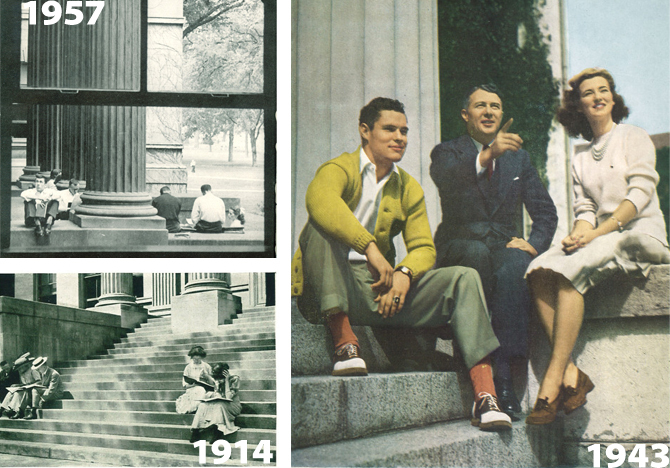 The free online collection offers a student voice on a century or so of UI history (1892-1992, with the exception of a few years in the 1970s when the yearbook wasn’t published). More than 38,000 pages evoke the fun and freedom of student life, from aquatics shows to bed races and military balls to political protests. Already, the digital versions of the Hawkeye have proved as popular as the print editions, garnering more than 27,887 page views since late January to become the Iowa Digital Library’s most-visited collection. Users can search the yearbooks by text or date to find photos of classmates and relatives, stories about the Iowa football team’s trips to the Rose Bowl, and much more. 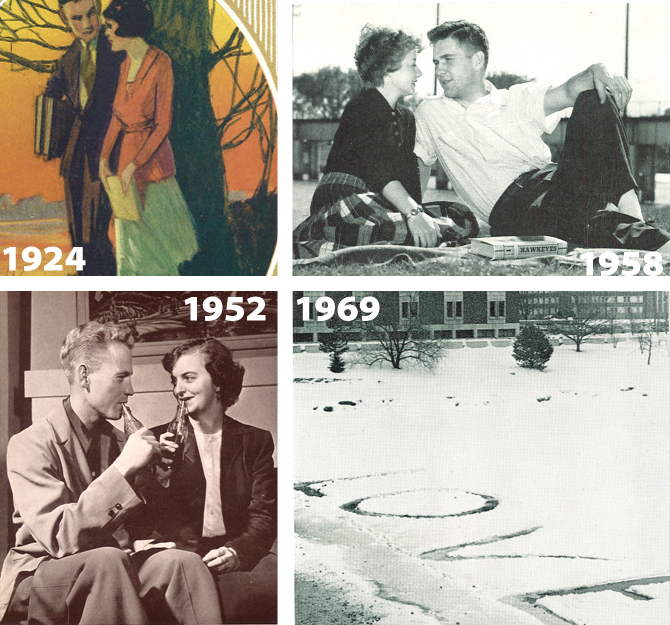 Here, Iowa Alumni Magazine showcases some stunning images from the Hawkeye’s 100-year run. 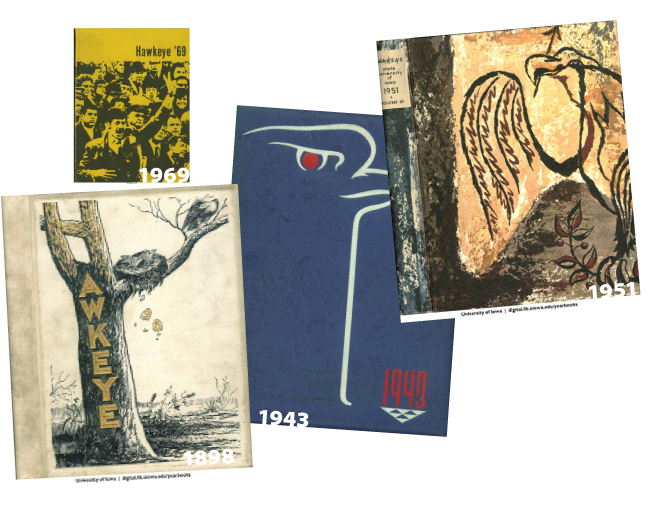 The different styles and themes of the Hawkeye yearbooks echoed what was going on at the UI and in the wider world. Students face staggering lines as they register for classes. Today’s Hawkeyes avoid the chaotic crowds by creating their class schedules online. 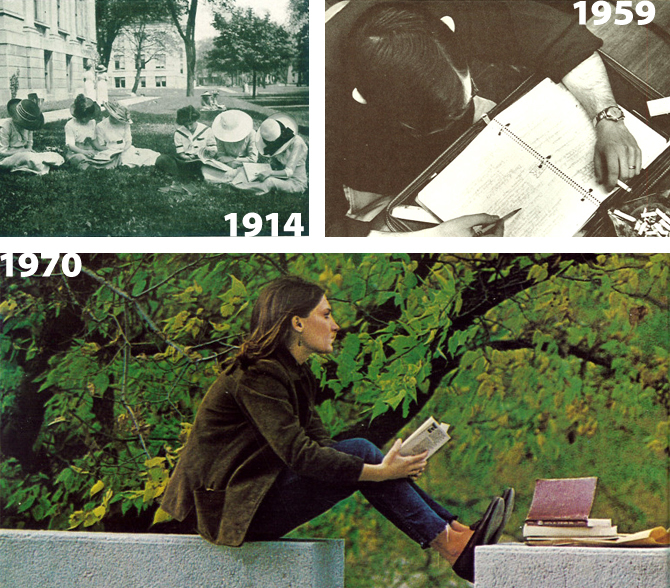 Whether on a sunny Pentacrest lawn or in a smoke-filled, caffeine-fueled study session, hitting the books has always been a core part of student life. 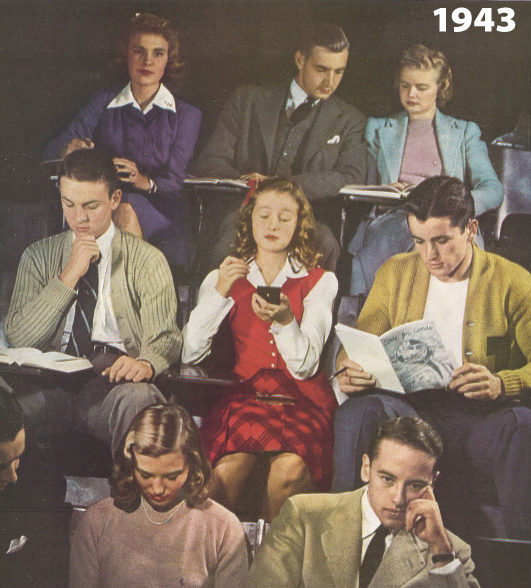 Lecture hall provides a plethora of distractions for these university students. 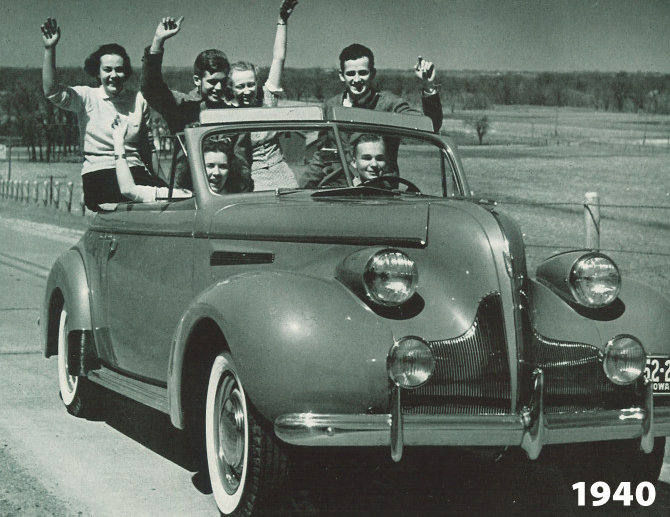 As essential transport—and for joyrides in the surrounding countryside—cars on campus have increased right along with student enrollment. A much-loved part of campus life, Homecoming has brought its share of traditions, including the corn monument built by engineering sessions that was set alight following a Hawkeye victory. Couples skate on Melrose pond. 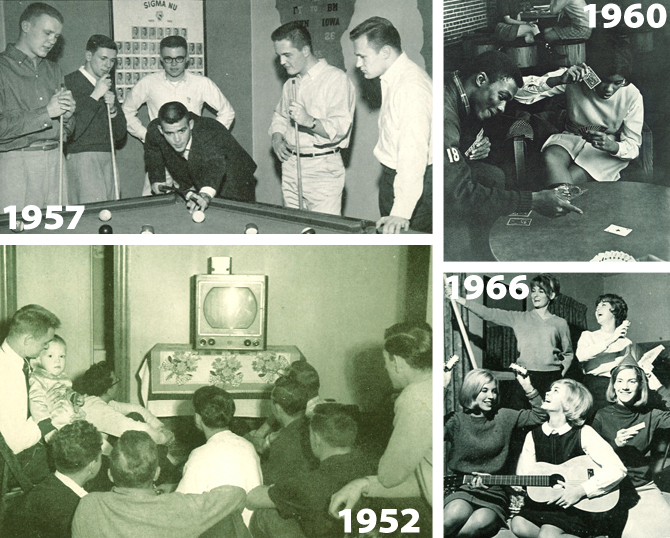 Outside the classroom, Hawkeye students know how to have fun, whether gathering around a piano or a community TV, playing a spirited game of pool or cards, or rehearsing a musical skit. 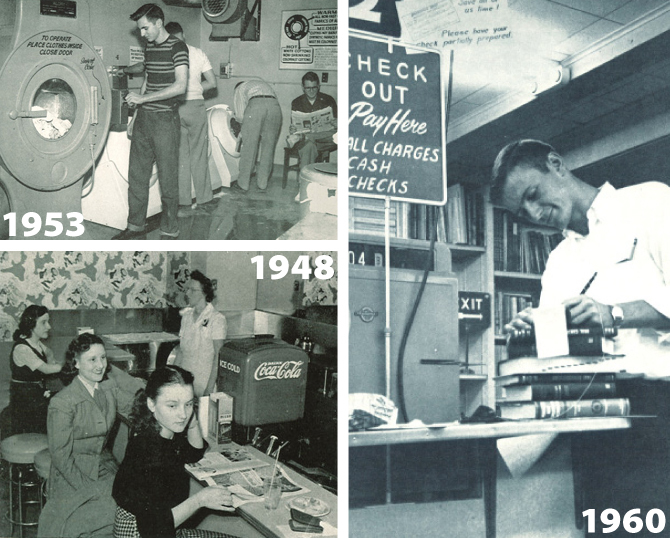 Top left: Rather than send their laundry home, these men wash their clothes at Hillcrest. 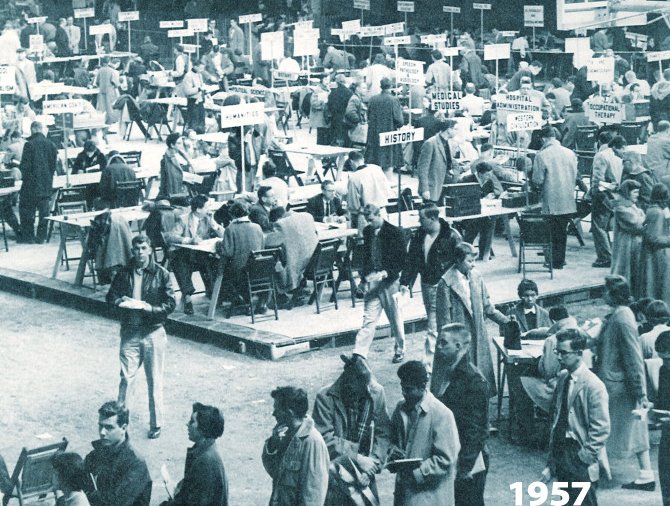 Bottom left: Women enjoy a study break at the Currier soda fountain. Right: A student pays for the semester’s textbooks. Right: A farm-themed party wouldn’t be complete without a slide down the hay. Bottom Left: Students race their beds down Clinton Street as part of the Homecoming festivities. 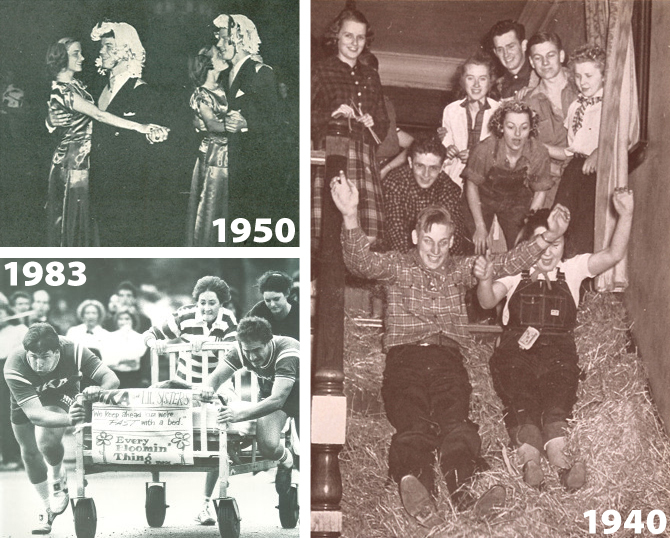 Top Left: These twins dance with their identically dressed dates at the Spinsters Spree. 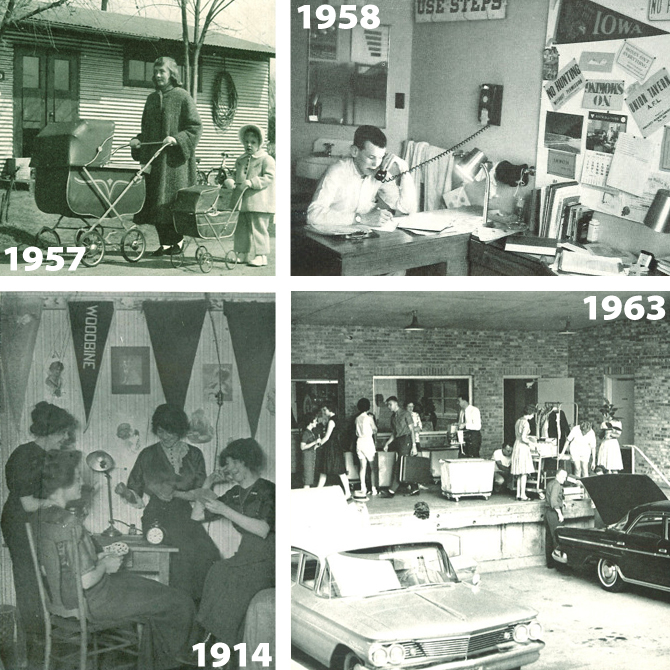 Dorms and married student accommodations have provided homes away from home for generations of students. Love often burgeons on a campus. How many countless students met their wives or husbands at the University of Iowa? At the center of the UI—literally and symbolically—the beloved Old Capitol. Graduation—a time when the hard work pays off, student life is over, and the world awaits.